You can selectively enable autoresponders for users. Setting to respond and deliver means the incoming emails are responded to but also delivered to the user. Selecting respond alone means the email is responded to but not delivered. You can have the responder automatically start and stop based on the date. You can set the responder to start on a particular date. You can set the responder to end on a particular date. You can set a custom subject for the responder. You can set a custom message for the responder. Default: Your email could not be sent to <recipient> at this time. 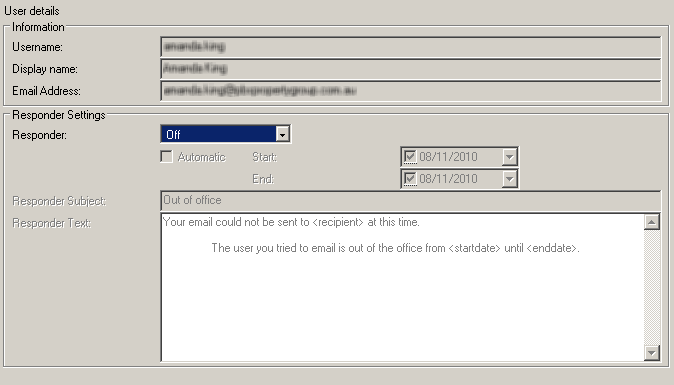 The user you tried to email is out of the office from <startdate> until <enddate>.